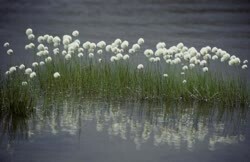 Kanguujait, the Inuktitut word used in North Baffin, means �what looks like snow geese.� A mixture of Arctic cotton grass and charcoal was once used to help heal the umbilical cord of a new baby. Also, warts were treated with oil gathered from the stem of the cotton grass in the spring. 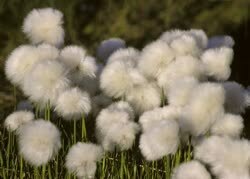 Cotton grass was also mixed with moss and used as a wick in the qulliq, or traditional seal-oil lamp. The fluffy flower head of pualunnguat can be eaten to relieve a sore throat, and in the past it was mixed with rancid seal fat to soothe aches and pains. We would always have to prepare things; for instance, if we were not going to go out hunting with our husbands on extended trips, we would first shred the plants that would be used for wicks on the qulliq. We would add some fat and mix it in the wick material, then put it in a container for the hunters to take along on their hunting trip. If we were to go along on a hunting trip it was up to us to prepare it properly, otherwise we would end up with wicks that burned too fast so that the flames would tend to be too high and burn too much.